I like that it has all the amenities provided. Plus the area has alot of food stores or restitution where it is easy to get. Also, there is a bus stop that would bring you to Central London itself. The room was very clean and the view was spectacular. Large bathroom . Picture are not of the appartment that you will get. The apartment was clean and reasonably well-equipped. We had a little difficulty finding it the first time, but after that we appreciated that it was only a short walk from the Aldgate Underground Station. Absolutely loved the location. Really neat part of east london. Apartment was very comfortable. the Apartments is very nice from outside but in side is not clean and bathroom also is not clean and not comfortable .and to collect the keys is different from the apartments and its far too to take it. its meaning we should take taxi from the airport to where the key will be collect and go again by another taxi to the apartment . it made us really confused . The property was clean. The beeds were comfortable. The location was good and the rooms weren't too congested. 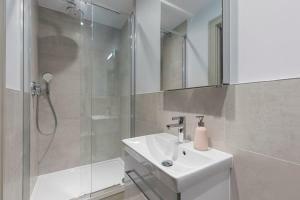 Wonderful location, very convenient and clean apartment. London City Apartments This rating is a reflection of how the property compares to the industry standard when it comes to price, facilities and services available. It's based on a self-evaluation by the property. Use this rating to help choose your stay! 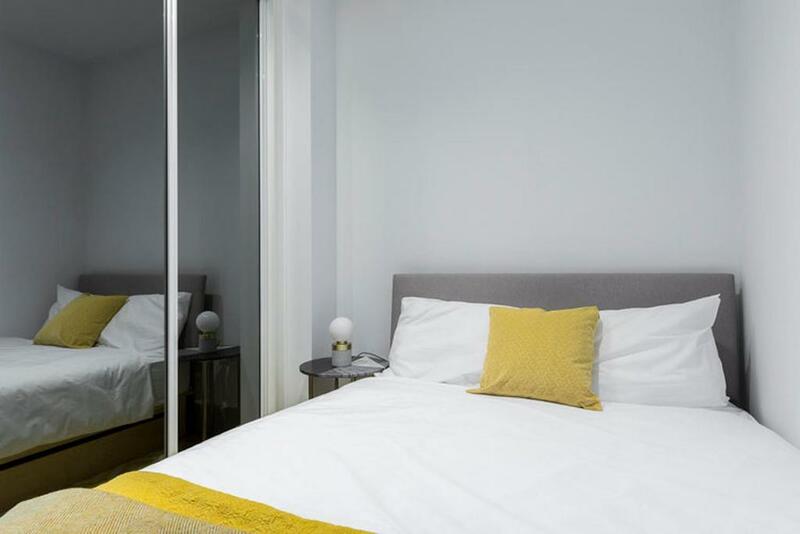 One of our top picks in London.In the Aldgate District of London, London City Apartments features stylish apartments with kitchen facilities and free Wi-Fi available throughout. City of London is just 5 minutes away by Tube (subway). With different locations around Aldgate, the apartments offer a full kitchen, a living room with flat-screen TV and DVD player and a private bathroom with bathtub or shower. A range of restaurants can be found in the area. Guests can go sightseeing in the surroundings and walk 0.8 miles to Tower of London and Tower Bridge. Canary Wharf is 23 minutes away by public transportation. Aldgate East Tube Station, with service to the Circle, District and Hammersmith and City Lines is just an 8-minute walk away. London City Airport is 38 minutes away, using the Docklands Light Railway. When would you like to stay at London City Apartments? This one-bedroom apartment features a full kitchen with electric kettle, a TV and DVD player in the living room area and a private bathroom with bathtub or shower. This two-bedroom apartment features a full kitchen, a TV with DVD player in the living room area and a private bathroom with bathtub or shower. This three-bedroom apartment features a full kitchen, a TV with DVD player in the living room area and a private bathroom with bathtub or shower. This apartment has a DVD player, electric kettle and seating area. This apartment features a DVD player, electric kettle and seating area. 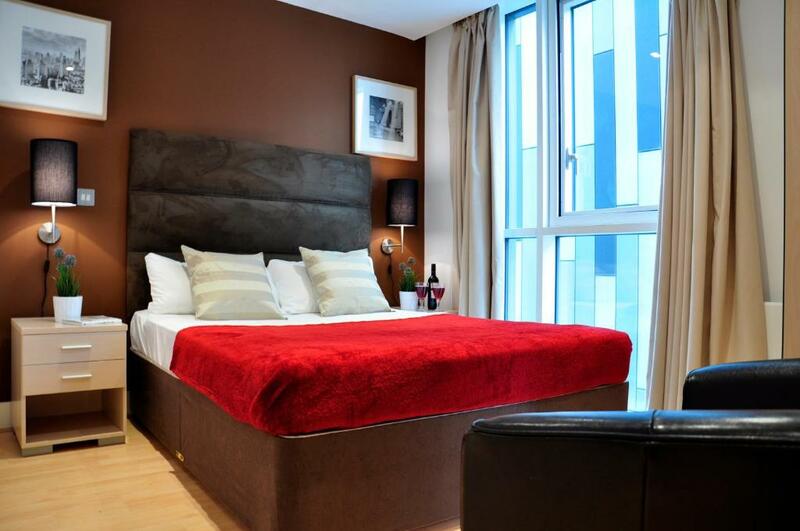 London City Apartments is offering you a great location to experience London from the inside. The apartments are located on the borderline with the City of London, the heart of financial center and are close to the vibrant and multicultural Shoreditch, plenty of restaurants, cool pubs and a variety of vintage and food markets such as Old Spitalfields Market or Brick Lane Market that attracts a lot of young artist from all over the world. The Tower Bridge can be reached easily and offer a great view of River Thames and the Tower of London. All the apartments are well located to move around central London with Underground ( better know as Tube or Metro ) from Aldgate, Old Street and Tower Hill stations. Modern features are provided for the best comfort and relax: LCD TV, free WiFi, and a washing machine. Some bedrooms have an individual tiled private bathroom, with a separate guest bathroom available.With hardwood floors throughout these elegant apartments, a well equipped kitchen features an oven, stove top, kitchen utensils and a dishwasher. Guests can eat together at the dining table. Our flats also come with bed linen and towels included in the reservation price. House Rules London City Apartments takes special requests – add in the next step! A GBP150 damage deposit is required 0 days before arrival (about USD195.73). This deposit will be fully refunded 0 days after check-out, as long as there isn't any damage to the property. London City Apartments accepts these cards and reserves the right to temporarily hold an amount prior to arrival. To check in, receive keys and pay for the stay, go to the office on the ground floor at: Unit 13, Adler Street, E1 1EG. Guests will collect the keys and get directions to their apartment. Please note that properties may be located within 20 minutes walk from the advertised area and the pictures shown are selected from several apartments. The apartments are of a similar standard, but may differ to the ones shown. Please note that for multiple apartment bookings units might not be located in the same building, guests are advised to contact the property as soon as the booking is made to request to be in the same building or as close as possible. This is subject to availability. Upon check-in, guests must show a valid, government issued photo ID and the credit card used for the booking. The card holder must be present upon arrival. The passports of all the guests and their list must be available during check in. Presence of all guests must be required. The apartment can be used only by the customers registered in the office. Visitors after 22:00 are not permitted. A security deposit of GBP 150 is required upon arrival for incidentals. This deposit is fully refundable upon check-out and subject to a damage inspection of the accommodations. When booking for 6 guests or more, a security deposit of GBP 50 is required per person. For last minute bookings the property reserves the right to increase the security deposit. A damage deposit of GBP 150 is required. That's about 195.73USD. You should be reimbursed on check-out. Please note that check-in and key collection take place at: Unit 13 Adler street, London E1 1EG. In booking.com did not say that we have to collect keys in different location. After it booked we just know. Weird apartment layout, towels and bed clothes were pilled up in the couch. Some noise from the building. The apartment was spacious and clean. Modern appliances. Good wifi. I was expecting it to be a bit bigger and I think they should show pictures of the actual place you are going to stay in and not every picture of every location. The noise was constant. Didn’t sleep. Also some dodgy characters in the building. The apartment was nice enough although blinds were broken so constantly dark. Took long time for check in . Nearly about 1 hours . The place was about 10 minutes walk from the collection so it wasn’t convenient as we had to walk with our luggages the whole way to get into our apartment. Other than that, the place was delightful. The property it self was clean, very tidy, staff very helpful aswell..
Having my headphones stolen shortly after check in by somebody with access to the apartment. We left to set up our business stand at London Coffee festival and came back to find the lights all on, our suitcases had been disturbed and my £300 pair of Bose headphones missing from the apartment. Staff were aggressive when consulted about the missing headphones and fairly sketchy approach to sorting it out. No compensation or help at all. So it wasn’t located in Aldgate it was located in Shoreditch just off brick lane. It’s the office where you pick up the keys that is located on Aldgate so I was sold an apartment with Completely different location there was no phone signal for me, the WiFi didn’t work, I was given two single duvets on the bed and no doubles duvet, lots of hairs in the bedding, and very dusty. The buzzer only works for the first door so if you have guests you will need to go down flights of stairs to let them in. People on the building were having parties so it was hard to sleep and lots of thick heavy cigarette smoke was also circulating around the building. It was really noisy. On top of that as soon as I made the booking the money was taken from my account. It was meant to be free cancellation. This whole thing is a scam operation. The location of the apartment was the location of the office where to pick up keys. The original apartment was quite far and the purpose if the stay was to be close to the venue of the wedding. I stayed with 5 kids but wasn't aware of the distance. The office upgraded us to another apartment not as far. On the second night I woke to banging from the front door and in the morning found that the deadlock was unlocked. Luckily I secured the yale lock. I emailed the office but 4 weeks later I have not had a reply. The apartment we got was really far from the metro and in not so nice and safe area (Philpot Street). It was really noisy in the night. The apartment was reslly nice and it had enough space. The kitchen was fully equipped.